I've found my forever home with a new bunny wife named Evie. 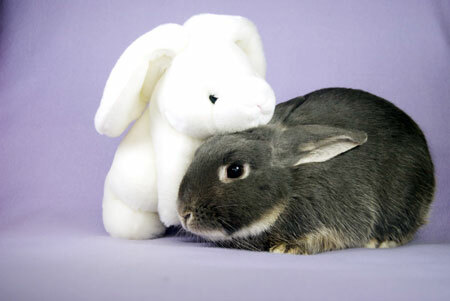 She was adopted from SaveABunny too...We're very happy together! Hi.My name is Wally. I am one of the nicest, sweetest, most loving rabbits here at SaveABunny. I crave attention and adore being petted and kissed. I run over to the front on my pen to say hi to everyone who walks by just hoping and wishing for a little love and attention. When you run my head, I flatten WAY down low so you can massage and cuddle me. Did I forget to mention that I am also a very, very handsome neutered silver marten boy? I am a perfect rabbit in almost every way, but one. This makes me a special needs rabbit. I have dental issues with my molars that requires periodic trimming of my teeth under anesthesia. This can be expensive, so whoever adopts me needs to be able to handle the financial aspect of adopting me as their forever friend. Aren't best friends worth it?